One of my favourite cookies is the famous Oreo! I remember as a child loving to slam dunk my Oreo in a glass of milk or to twist it to lick the icing. So yummy! There are definitely more varieties of Oreo’s now including the Golden Oreo. This Golden Oreo Cupcake recipe is for all Oreo lovers! I hope you enjoyed my Golden Oreo Cupcake Recipe! If you make it, make sure to share with us on Facebook or Twitter! Also, check out all of our other Recipes. oh my gosh!! golden oreos…now we’re talkin! Oh dear. I am a huge sucker for Golden Oreos which is odd as my go to treat is chocolate! These look so yummy. I love cupcakes! This looks amazing. Would eat these until I can’t move. 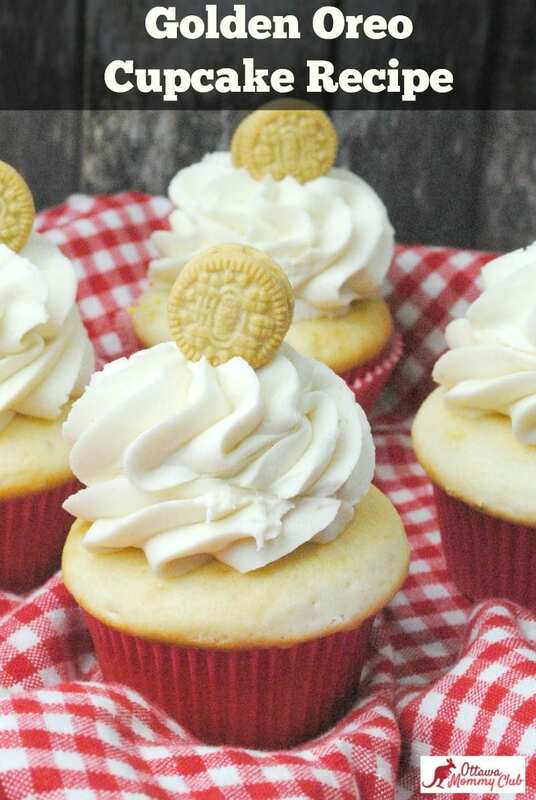 I actually have never to tried Golden Oreos, but these cupcakes look delicious! And they make mini versions of the Golden Oreos too? Neat! This looks like a lovely recipe; my bestie is pregnant with her second child and craving anything white or yellow cake, so maybe I’ll make her a batch of these. Thanks! I tried Golden Oreos for the first time last week, and let me tell you, I probably shouldn’t have! I am now seriously in love. Oh gosh – these would be great for my mom’s easter party! Wow, golden oreos are my fav! These looks so good! I love cream cheese frosting, but I don’t see an amount in the ingredients for the cream cheese? My kids go wild for these golden oreos.They are going to love these! Thank you. Saw this on your Instagram. I am the only one that I know of that loves the Golden Oreos. This is going to be perfect to make! These sound delicious as well as being adorable!!! I know the kids would devour these! These look great, I will have to try them, thanks. I would love to make this frosting but how much cream cheese do we use? I don’t see it in the ingredients list. Thanks. Cookies, cream cheese and cupcakes? What a yummy combination in a treat. These cupcakes look really good and I didn’t know that we had the golden Oreos here in Canada but I honestly avoid the cookie isle because it’s too much temptation. Thanks the kids are going to enjoy those.Enjoy your weekend! Thanks for the recipe these certainly were a hit with the grandkids!